Zion Market Research has published a new report titled “Erectile Dysfunction Drugs Market by Drug (Sildenafil Citrate (Viagra), Vardenafil (Levitra/ Staxyn), Tadalafil (Cialis), Udenafil (Zydena), Lodenafil Carbonate (Helleva), Stendra/ Spedra (Avanafil), Mirodenafil (Mvix), and Others), by Mode of Administration (Oral Medications, Topical Medications, Injections, and Others), and by Distribution Channel (Hospital Pharmacies, Retail Pharmacies, and Online Sales): Global Industry Perspective, Comprehensive Analysis and Forecast, 2017 - 2024”. 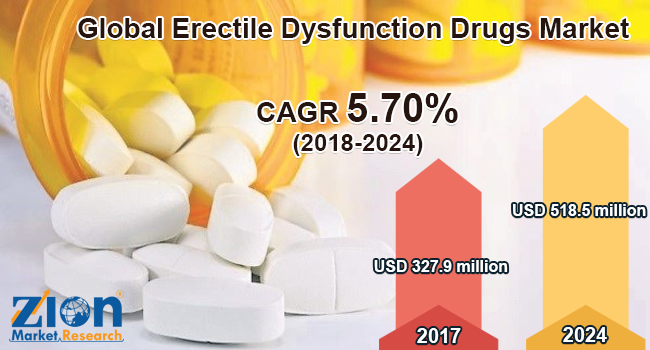 According to the report, global erectile dysfunction drugs market was valued at approximately USD 4.82 billion in 2017 and is expected to generate revenue of around USD 7.10 billion by end of 2024, growing at a CAGR of around 5.70% between 2018 and 2024. The demand for erectile dysfunction drugs is highly growing due to a high incidence rate of chronic diseases including hypertension, neurogenic and psychological disorders, and diabetes. Besides these, rising aged population, alcoholism, sedentary lifestyles, and smoking greatly increases the risk of erectile dysfunction. Growing adoption of these poor lifestyle choices leads to the overall growth of the market for erectile dysfunction drugs. Other factors like patient awareness and education, a growing number of campaigns by government and non-government organizations worldwide to make patients aware of the disease are also other factors responsible for the market growth of erectile dysfunction drugs. The erectile dysfunction drugs market is divided on the basis of drug which is further divided into Sildenafil Citrate (Viagra), Mirodenafil (Mvix), Vardenafil (Levitra/ Staxyn), Tadalafil (Cialis), Udenafil (Zydena), Stendra/ Spedra (Avanafil), Lodenafil Carbonate (Helleva), and others. Viagra is one of the most widely distributed products worldwide. Viagra dominated the market in terms of revenue and was valued at over USD 2.4 billion in 2014. Though its patent expires by 2019 in the U.S., it is anticipated to account for almost 27% of the market share by the end of 2024 due to its brand loyalty worldwide. The erectile dysfunction drugs market is categorized on the basis of mode of administration into oral medications, topical medications, injections, and others. The oral medication segment is likely to dominate the market since the first line of treatment or medication for erectile dysfunction comprises of oral medication. Oral phosphodiesterase type 5 inhibitors are commonly used in erectile dysfunction drugs across the globe. Viagra and other PDE 5 inhibitors such as Cialis and Levitra/ Staxyn are extensively consumed for erectile dysfunction treatment thus propelling the market for oral medications. Based on the distribution channel, the market is segmented into online sales, hospital pharmacies, and retail pharmacies. The online sales segment is expected to grow at the highest CAGR over the forecast period. The presence of online sales is a blessing in disguise for several patients who are conscious about visiting a retail pharmacy store to purchase drugs for erectile dysfunction and other sexual wellness products. Regionally, the erectile dysfunction drugs market is segmented into Europe, North America, Asia Pacific, the Middle East & Africa, and Latin America. North America is the leading contributor of the erectile dysfunction drugs market owing to the presence of established healthcare infrastructure, high demand for these drugs, and growing research and development initiatives pertaining to the new novel drug molecule development. Also, high awareness among the people about the disease, prolongation of patent exclusivity rights for Viagra in the U.S. and presence of a large number of players in the region are the key factors contributing to the growth of erectile dysfunction drugs in this region. Some of the leading players in erectile dysfunction drugs market include Apricus Biosciences, Bayer AG, Cristália, Eli Lilly and Company, Inc., Pfizer, Inc., Dong-A-Pharmaceutical Co., Ltd., S.K. Chemicals Co., Ltd., Vivus, Inc., Teva Pharmaceutical Industries Ltd., and Meda Pharmaceuticals, Inc. Pfizer, Inc. accounted for almost 40.0% market share in 2012. Yet, the market share of the company is likely to decline due to the patent expiration of Viagra in 2019. However, generics are expected to propel industrial growth. In addition to mergers, acquisitions and collaborations activities, post-patent expiration, and geographic expansion are likely to keep the industry rivalry at higher levels in the forecast period.